A reward has been offered to track down alleged drug lord Peter Lim, who has turned fugitive. The Department of Justice has offered a 500,000-peso bounty against Cebu-based suspected drug lord Peter Lim. The DOJ offered the bounty after law enforcement authorities have yet to find the “businessman” who is allegedly one of the top drug lords in the Visayas. “The DOJ warns persons coddling Peter Go Lim, who has been indicted for conspiracy to trade in illegal drugs, that they will be prosecuted for obstruction of justice and punished accordingly,” Guevarra added. An arrest warrant and a ‘hold departure order’ — which bars him from leaving the country — were issued last month. The DOJ has filed two counts of the non-bailable offence of conspiracy to commit illegal drug trade in violation of Section 26(b) in relation to Section 5, Article II of Republic Act 9165, the Comprehensive Dangerous Drugs Act of 2002. Aside from Lim, those who have been named as his co-accused include self-confessed drug lord Rolan “Kerwin” Espinosa, Espinosa’s associate Marcelo Adroco and Ruel Malindangan. Both Espinosa and Adorco are in government custody, but Malindangan is at large and also the subject of an arrest warrant. Espinosa, Adorco, and Malindangan are also facing two counts of conspiracy to commit illegal drug trade at the Manila RTC and Makati RTC, along with convicted drug lord Peter Co and alleged drug supplier Lovely Impal. A hearing for Lim’s co-accused was supposed to continue today, but was canceled due to the approach of typhoon Ompong. Long-time Duterte friend Peter Lim WAS in police custody, and he even met with Duterte. But they let him go, because he’s a friend of Duterte. 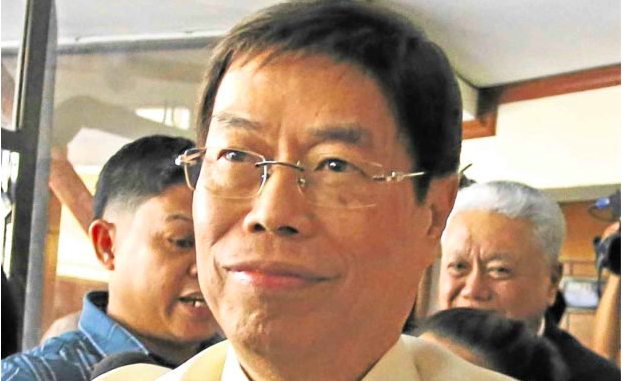 “Well, the alleged suspect, drug lord suspect Peter Lim has already expressed his intentions to clear his name, let’s leave it at that,” Communications Secretary Martin Andanar said in July 2016 regarding the release of Lim. So 23,000 poor people have been slaughtered in the streets, many because of rumors. Now that Duterte is still being criticized for this and other releases of notorious drug lords, it’s time to pretend to seek Lim. But they have given Lim two years to sell his Cebu assets and leave the country. He’s on a beach in China.